PDF file of a behavior contract. 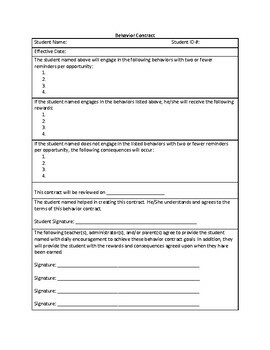 This contract can be filled out with the student, teacher, administrators, and parents. There are options for four behaviors to discuss, four possible rewards, and four possible "consequences" for not following contract. This contract includes spaces for the student to sign as well as up to four others.